Well, we had to do something! The paddocks were getting into a terrible state, and relying on the goodwill of our neighbour to fit in "a bit of topping work" was not working out. But all the prices I'd seen ranged from rather expensive to just plain ridiculous. I looked at them all - but a "real" tractor, would start at £5-6,000 for a fairly old 2nd. hand model. We only have a few acres, so what about one of those big lawn tractors? But I found the same price again - plus the cost of the attachments were 2/3 times the agricultural equivalent. Same problem with a 4-wheel drive Quad bike. I realised we needed a standard 3-point hydraulic linkage and PTO just to keep the cost of the attachments down. 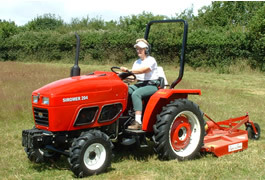 I'd seen a few "compact" tractors, mostly imported from India - but again all around this same "magic" £5/6000 price. Then I finally came across the Chinese-manufactured Siromer - priced at £2950! It seemed to have all the basic things - 4-wheel drive, rear hydraulics, PTO, power steering - that you find on a "real" tractor. And the compact size was in fact an advantage in our small paddocks. This seemed too good to be true, so I spent some more time trying to find the catch. However, after talking to a couple of existing customers locally, who seemed very happy, I took the plunge. I must admit, I'm still looking for the catch. In fact, it gets better. I tried to get the attachments I needed to look after the grazing - topper, spreader, tipper box and chain harrow - from local farm sales. I still couldn't beat Siromer's prices on new equipment. So I ordered the attachments from Siromer too. Would you believe a 500 litre fertilizer spreader for only £325? And the tipping box was just £195. Delivery - on eveything - was 1 week from placing the order to standing in the farmyard. The people I spoke to at Siromer - Cath and Jeff - were always patient and helpful. What more can I say? OK - let's try to to look at what you don't get in the deal. First off, the £2950 price is for the lowest power model - 20HP. So if you want to plough 100 acres before lunchtime, look elsewhere. The available power is fine for what we need - it's just a bit slower than something 2 or 3 times the price. Otherwise, pay more and get the 25, 30 or 35HP model. However, it does come in Ferrari red, so at least it looks fast! Also, the low price is a special offer on the 204 model as a flat-pack ex works. But I spoke to the local guy who supports Siromer in Devon - John Barrow of Sheddymoor - and he came up with an embarrasingly low price to complete the build and arrange delivery. The only slightly negative comments I could make - and I'll have to try hard - concern the quality of the finish. Well, it does have quite a few rough corners, and some parts look rather "clunky". I don't think it would be the ideal choice if you were planning to use it round the clock, seven days a week. But the only specific problem we've had so far was a dead fuel gauge on delivery. This turned out to be nothing more than a loose wire. And before you ask - no, I don't get any commission on sales!